You are in the 105th Trainee Squad, your heart set on joining the Survey Corps after graduating. On the day of your initiation ceremony, a Titan breaks through the outermost Wall Maria, putting what remains of humanity at immediate risk of extinction. Eren Jeger is your only hope for survival. You have 60 minutes to save him, save humanity, and escape with your life. This is the scenario thrill-seeking participants are presented in “Escape from the Walled City,” the mass escape game that has recently toured stadiums across Asia and the US. First invented in Japan (because where else), escape games place participants in time-sensitive scenarios in which they must, very literally, escape the premises by solving a series of logic puzzles including riddles, word puzzles, and number games which range from the somewhat simple to the nearly impossible. Normally, these take place in cramped rooms with a small group of people. But a “mass escape game” is exactly what it sounds like: a stadium full of contestants racing against the clock to avoid the public humiliation of losing a game they paid good money to play. But losing, at least for some, is inevitable — many games in Japan have had less than a 10% success rate. But what better way to build an escape game than with an Attack on Titan theme? The massively popular manga and anime series, set in a city contained by walls, lends itself beautifully to such a scenario with very little need for a stretch of the imagination (except the fact that there are not actually sinewy skinless titans trying to eat you — sorry to disappoint, folks). Naturally, I had to try it. So I rallied a group of four comrades (groups of three to six are recommended), and set off to Weingart Staduim on the East LA College campus early on a Saturday morning. 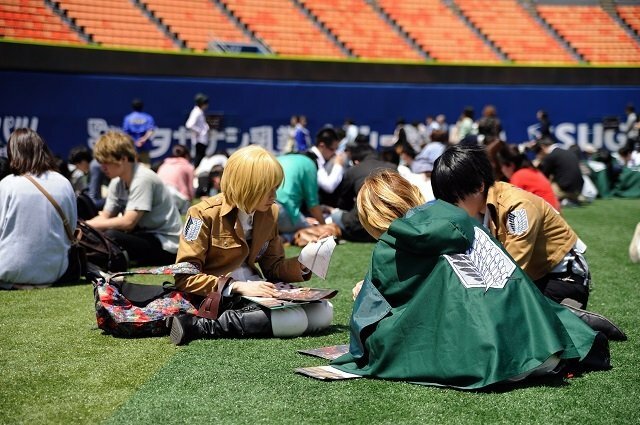 Upon arrival, we were greeted by staff in full Attack on Titan Survey Corps attire, and given a packet of instructions, which included rules, a story background, and the materials we would need to start the game. At 10:00 sharp we were ushered into the stadium and told — well, ordered — to form ranks and salute as members of the newest Trainee Squad. 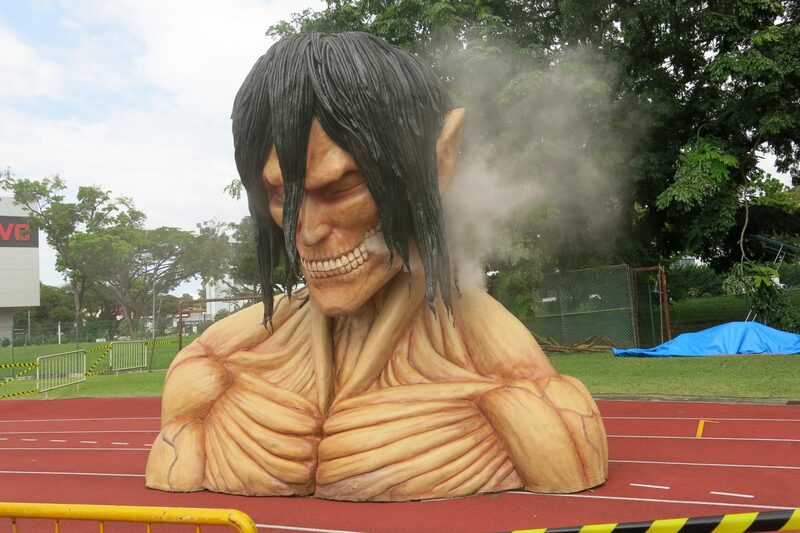 A life-size bust of Titan Eren loomed over the field as the Attack on Titan soundtrack rang eerily through the empty bleachers. Someone called the order to “go,” and the newly-formed ranks disbanded at lightning speed, flocking to the first set of puzzles as if their lives actually depended on it. While I can’t go into details of the puzzles and their solutions (spoilers! ), I will say that the 60 minutes I spent in that arena were some of the most equally panicked and focused minutes I have ever experienced in my life. And I loved it. With just seconds remaining on the clock, my team solved the final puzzle and crossed the finish line, saving Eren and ourselves from the terrible fate of being eaten alive. Other than that, winners don’t get anything but street cred and a hand stamp, but believe me – after that heart-pounding experience, it was enough. “Escape the Walled City” has recently wrapped up its US tour, hitting San Francisco, Los Angeles, and New York. But if you missed it, don’t fret — the tour was a success and you’ll likely have the opportunity to participate in a game soon enough. Mass escape games not your style? Smaller-scale escape room games are also gaining popularity, and have been popping up in urban areas, most notably in LA and San Francisco. The most popular of these include Real Escape Room (created by SCRAP, the company that produces the mass escape games) and Escape Room LA, but there are plenty to choose from in large cities. Not only do these provide an unbeatable team building exercise and mental workout, but they’re great entertainment to boot. Have you ever participated in a mass escape or escape room game? Did you win? Let us know in the comments!